Hi everyone - It's Enfys here, my turn to set the challenge this week. I made it a colour challenge - you can use any shade of aqua, blue and purple. The twist is, you MUST use all three colours on your project. This is our Stashbox Stamp week, so dig out your favourite rubber stamps and get set to join us in our challenge. Onto the Design Team inspiration! For more details on each creation, just click on the names and we'd really like if you left us comments on our blogs! The design team will be hopping around to look at, and praise your creations. Good luck! The challenge will close on Sunday 8 May at 12noon GMT. Audrey For this CAS card I used the All Around And Everywhere CD. I used my La La Land Cupcake Rosie stamp and colored it with Copics. I also used my S.U. Birthday wishes and used 3D Dots for dimension. For the corners I used my S.U. 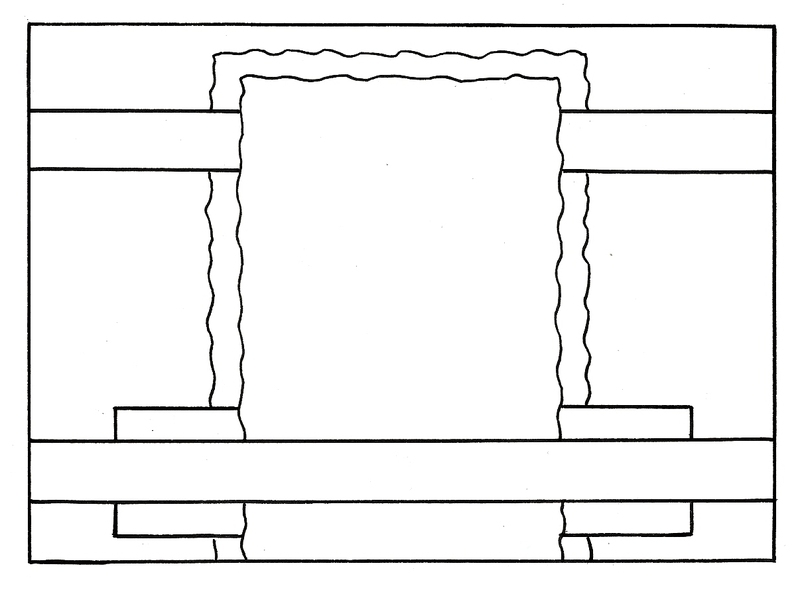 corner ticket punch. D'Anne - Hello Friends! Today I create a card incorporating the required colors in a different way using embellishments. I started off with the digital papers from the Double Sprinkles of Kraft CD. 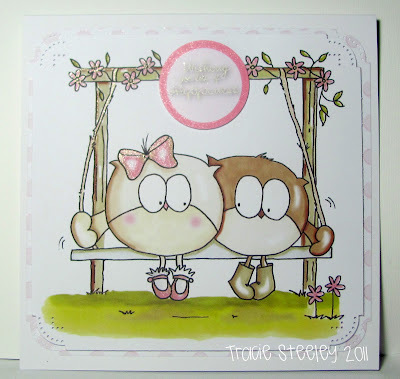 The main image is a stamp called 'Serene Spring' from Stampin Up. 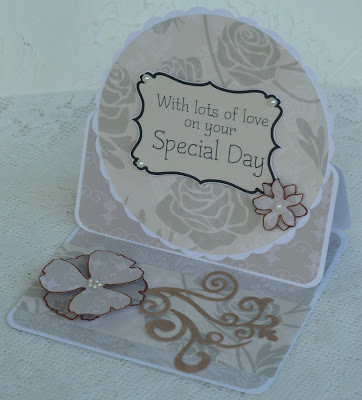 I embellished the card with digital felt flowers, digital brads/fiber, ribbon and clear dew drops colored with Promaker. Fiss - I had a bit of a struggle with mine as I have printer problems at the moment and my card was the result of a rummage through my stash to find the colours necessary. As I only had bits left, my background is made from strips of paper, all from the Sundae of Seasons CD except the purple floral one which is from All Around & Everywhere. As the background is quite busy I added simple elements to finish with a butterfly by Inkadinkado. Lou: I have use the "Sundae of Seasons" CD (Blue section) for my papers for this week challenge. I have also dusted off (literally) this Anya stamp which I have coloured with Promarkers. Lots of punching and diecutting to add layers/dimension; gorgeous bias binding ribbon which has been scrunched and finally, paper roses. Emma - I have used the Sundae of Seasons CD for my papers and embellishments, then I have used my favourite little house stamps from Be Neighbourly. 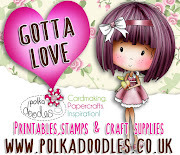 The glitter is Stickles, the faux brads are Craftwork Cards and the punched leaves are Martha Stewart, all available in the Polkadoodles Web Shop. Saskia - Run, run, run! I hope he'll be on time!! 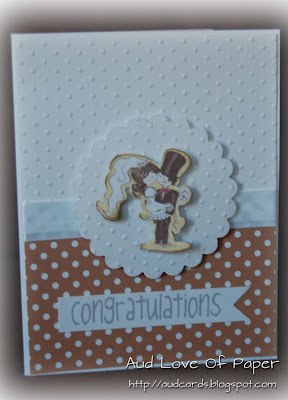 I used the great rabbit stamp and text stamp from the Wonderland Rubber Stamp Sheet. The lovely purple and aqua papers are from the Wonderland cd-rom. To add some blue colour, I added ribbon and stitches! Claire: The Wonderland cd has perfect papers for any occasion. I have used papers from the cd to paperpiece the cloud that Michael is snoozing on. I have coloured the rest of Mo Mannings stamp using Promarkers. Ribbon loop Martha Stewart punch for purple layer. 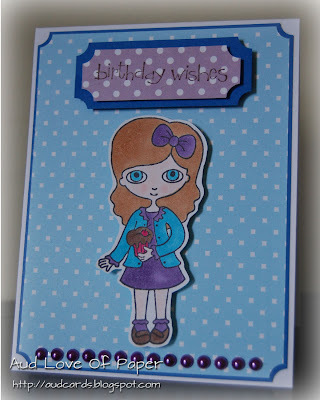 The Special Wishes stamp is a freebie Polkadoodle stamp on Papercraft essentials magazine. lis-m : this week i have used the Back to Nature cd, the papers all came from this, Dress-up Marci rubber stamp coloured with Promarkers, a little seam binding, and a flower button from stash. Miria This week I used a Tilda from my stashbox, coloured with waterpencils, all the fab papers are from Wonderland, the butterfly is from All around and everywhere. Lace, ribbon and charm from stash. Colette - This week I have used one of my favourite (I only have about 3 LOL!) rubber stamps, it's from Inkadinkado and I'm not sure it's even available any more, I have had if for years! The image was stamped with chipped sapphire TH distress ink onto white card, then mounted onto aqua and purple card. The papers are all from the Wonderland CD. I used a Martha Stewart border punch for one of the layers and used the little left over petal shapes to make the three little flowers. The ribbon was white and coloured with promarkers in lilac, cool aqua and pastel blue, a couple of gems from stash finished off the design. 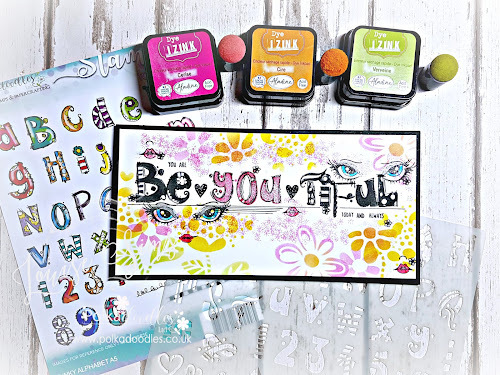 Ruth: I've used a Rainbow Studios stamp, coloured with Promarkers, a bit of stickles and liquid pearls and the papers are from Sundae of Seasons. It is quite a large stamp and my card is A5 in size. The reason why I have a panel at the bottom of the card is revealed on my blog! Josie: This week I used the Fairy Flutterfly Stamps (which I never tire of using) and coloured with Pro Markers. The backing papers are from Not For Girls CD Rom. 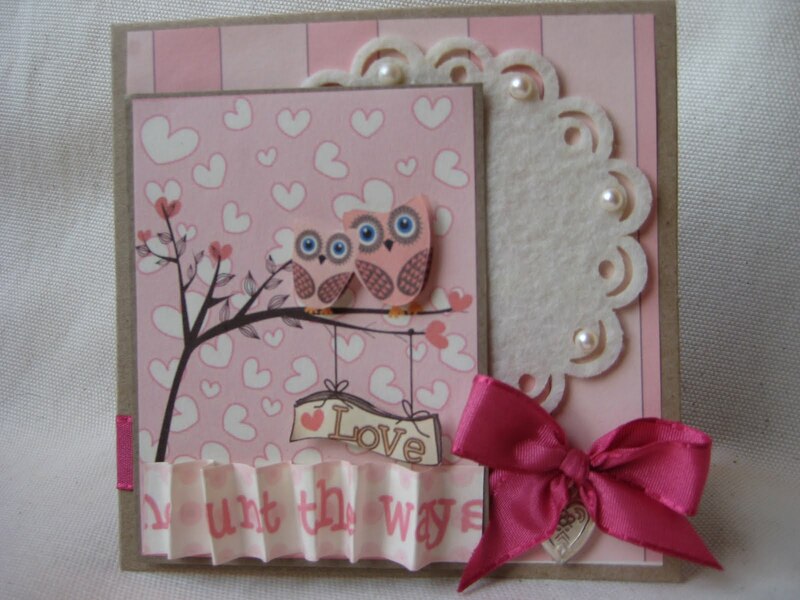 Finished with some beautiful Fru Fru Ribbons, sentiment from the Stamp Doodles set and some feathers and flowers! Good luck - the challenge is open until Sunday 8 May at 12noon GMT and don't forget our rules! Welcome to another Polkadoodle challenge! This week, the challenge is to use three different pattened papers in your creation - and if you are stuck for inspiration, just look at the Design Team samples! Onto the Design Team inspiration! For more details on each creation, just click on the names and we'd really like if you left us comments on our blogs! Ashley- I used the Sprinkles of Kraft cd. Lots of great goodies in there. All 3 of the papers and the image are from that one cd!!!! How awesome is that! 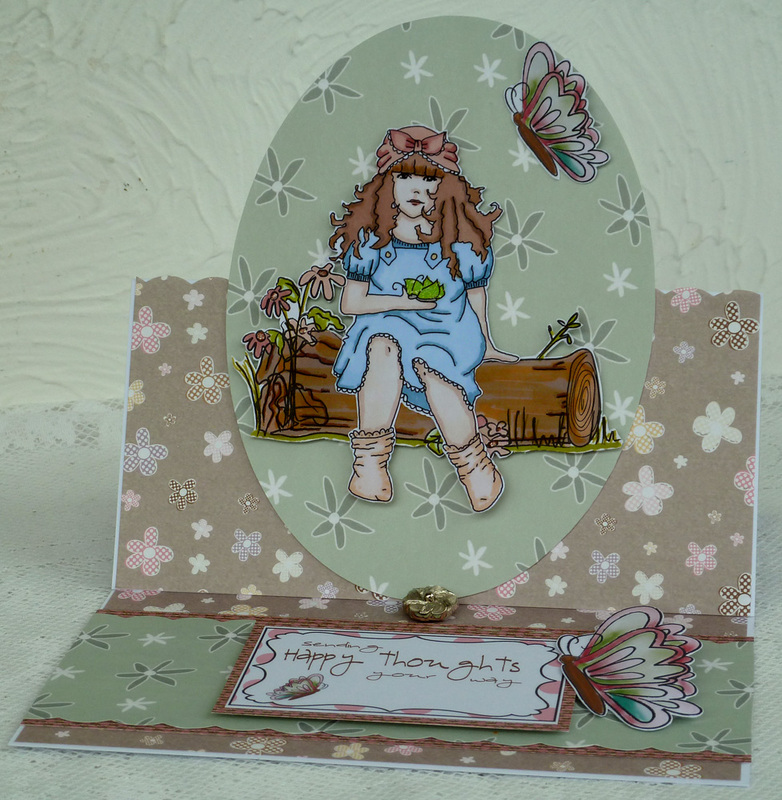 I used a Ek punch, and added some home made scrunch ribbon add a few flowers and you have a card. Oh and the Stamped sentiment is from the Polkadoodles also !!! Emma, hello there, I have used three different papers frm the Wonderland CD, I layered up and sculpted three punched out flower shapes, hand cut a stem and leaf to make the main flower then glued a pearl into the centre. The punch edge is a Martha Stewart. Finally I whipped out my little sewing machine and stitched a border round the edge. All the paper edges were touched with Weathered Wood Distress Stain. Enfys: There are three pattern papers on here, honest! All the aqua papers are different patterns from the Wonderland CD. I am rather into clean and simple at the moment. The leaves were die cut and the rolled flowers are a circle of paper cut with a scallop scissors into a spiral, then rolled. I put a punched circle in the centres and sprinkled that with seed beads. The lettering is Thickers by American Crafts. Punched borders are Martha Stewart. D'Anne - April showers brings May flowers! I created my card using the digital papers from the Wonderland CD. The digital flower element and sentiment is from the summer collection on the Sundae of Seasons CD. I used pink and white liquid applique on the flowers to provide more texture. Talk about simplicity making an impact! Fliss - I decided to take the opportunity to show one of the samples I made for the new and fabulous A Double Sprinkle of Kraft CD as it has the required 3 papers element. 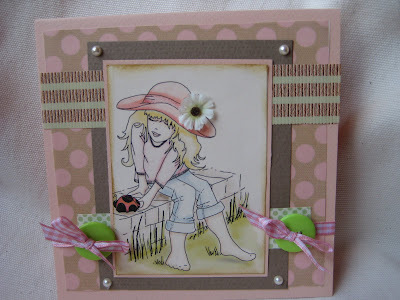 The card is another unusual easel style with one of the pretty girls that I decided to sit on the log. All images were coloured with Promarkers and I added pretty butterflies and a sentiment together with a vintage button from my stash as the stopper. Audrey For this card I used the super fun CD Double Sprinkle Of Kraft. . Wait until you see all the fun goodies on this one! I used 3 different papers on the card and they all go so well together. There is also an adorable alphabet set that I used for the "Hello". I used my S.U. 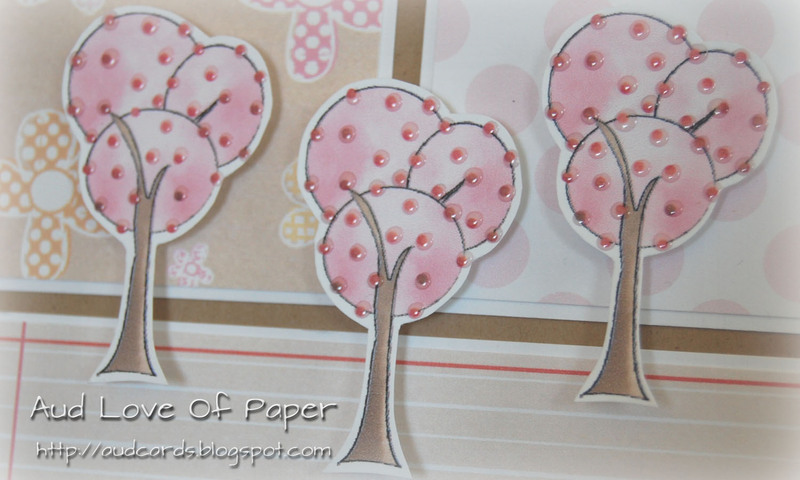 corner ticket punch for the corners, 3D Dots to give some dimension and Glossy Accents on the polka dots on the tree to make them shine. Lou: I have made another A4 card using the "A Double Sprinkle of Kraft" CD and have had a play with the alphabets section. Now I'm not at all computer savvy but I managed to make this huge topper very easily using Publisher (which is a normal desktop operation on my PC). 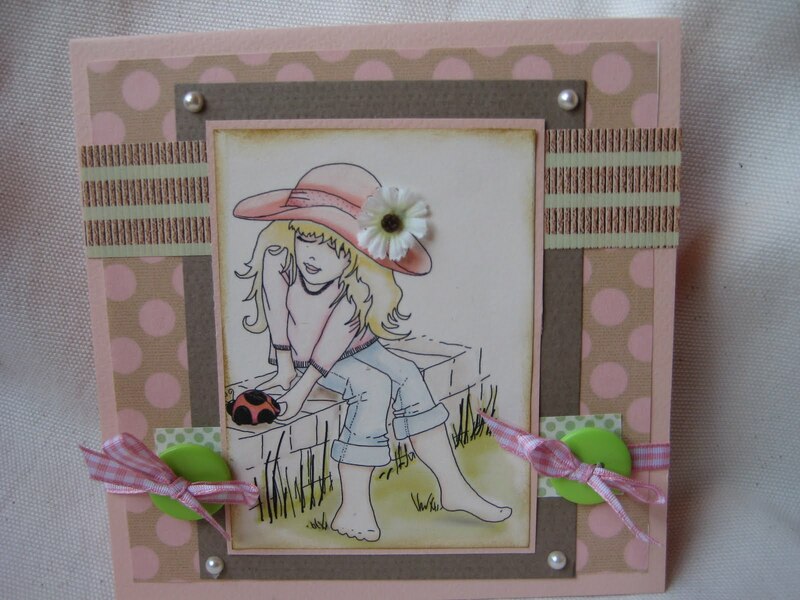 I have used the cute daisy paper, layered some spotty strips and then finally placed my words on top. I have decoupaged some of the letter to give a further 3D feel. Also in a moment of madness (!) I have covered the huge topper with an acetate dome . . . which has then made it very hard to photograph my card! Card finished with oodles of yummy card candy. Lis-m : I have used the Sprinkles of kraft cd, and the cute Winnie the Owl image. 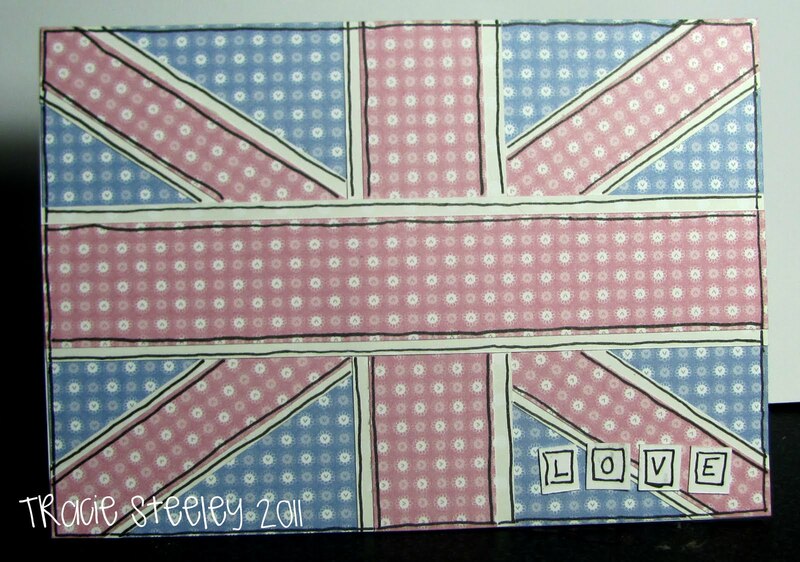 The images were already precoloured so a quick easy card again for me; a simple layout, my third paper being a "paper ribbon", add a button and a sentiment. Easy! 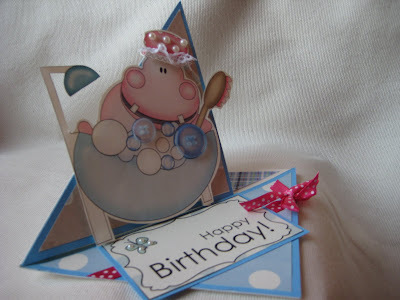 Tracie: I used 3 different papers from Sundae of Seasons to create my Patriotic card. Miria I made an easel card with a twist, the coloured stampie is from Paper Boutique vol.III, the papers and sentiment from Double sprinkles of kraft, embellies and buttons from stash. Colette - I cut strips of three different patterned papers from the Wonderland CD and a plain paper, and then weaved them to make the background for my card, The little baby is from the Sundae of Seasons CD. 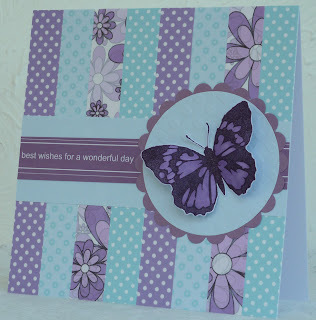 The corners are made with a Marianne Creatables die and I also used a Go Kreate die for the mats in the centre. The pearls are from my stash. Josie - This week I used 3 papers from the Not For Girls CD Rom. I printed off one of the papers much smaller and made it in to a topper. I used Distress Inks around the edges of each paper. Dee: I've used papers from the Double Sprinkle of Kraft cd for my card this week. I've made a nice bow from blue raffia with added button, and I added a few gems to finish it off. Ruth: I just can't make one baby card - I have to make both boy and girl! 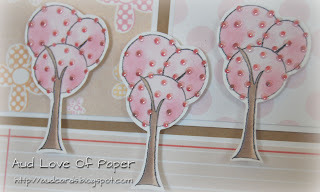 I've used three different papers from Candy Doodles (just perfect for baby cards!) 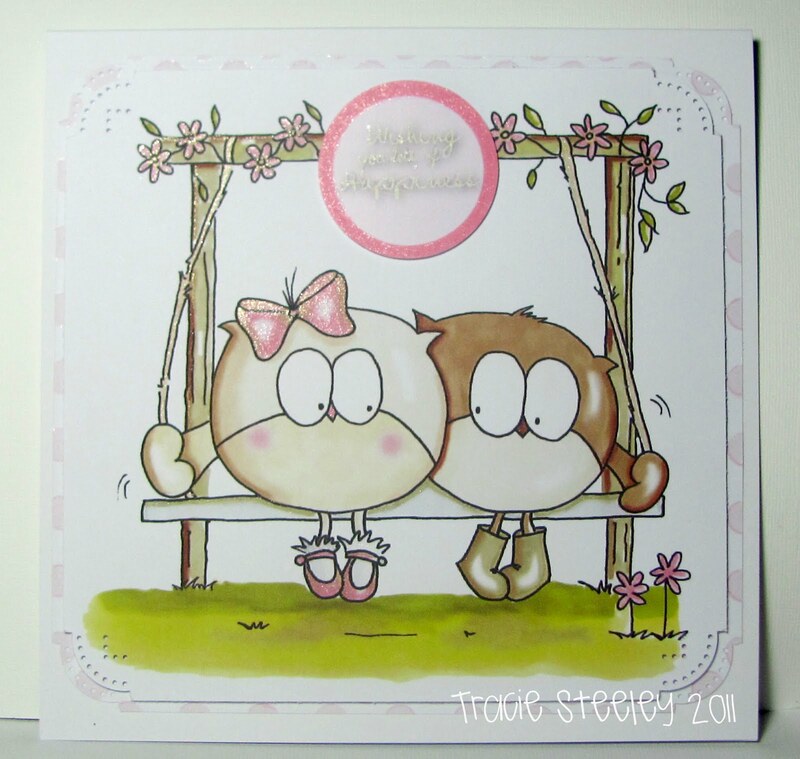 along with the cute Nellienoo rubber stamp which I've coloured with Promarkers. All the other additions are from my stash. Good luck with the challenge! It is open until Sunday 1 May at 12noon GMT and please remember our rules! Hi folks, it is Emma here to welcome you to a new challenge. This is always the time of the year when wedding invitation's arrive, I am going attending one in a few weeks time. So, I thought it would be nice to challenge you all to make something with a wedding in mind. Whatever it is you make as long as it is suitable for a wedding, perhaps a card, gift, keepsake or even table dressings, we would love you to join in with us this time. Congratulations! Please email Nikky with your placing and challenge number in the subject field for your blinkies! 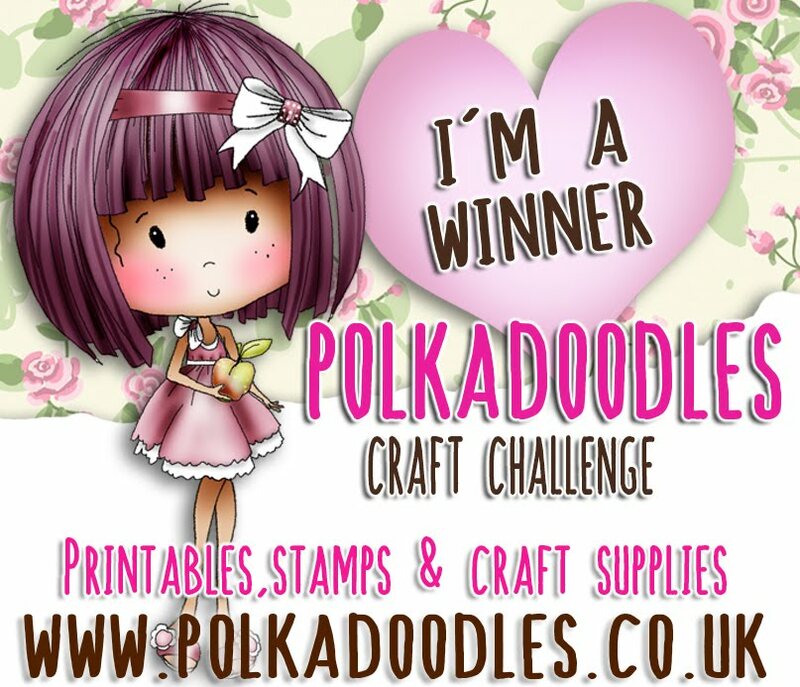 The first place winner will receive a Polka Doodles download! Now onto the inspirational Design Team samples! D'Anne - Let's Live, Life and Love! My card and sentiment was created from the Love & Cherish cd. Not sure if you can see from the photo but, I dressed up the Bride and Groom. The bride's wedding dress was embellished with dazzling glitter. The grooms top hat and over coat was embellished with black glitter. Ruth: I've used Paper Boutique Vol 1 for my creation and simply printed the church in A5 size and layered it up with foam pads. I've added a bit of glitter glue here and there, and that's it! Emma I have been very lazy this week and just enjoyed printing out the ready made image sheets from the Love and Cherish CD. All these items came from just one sheet and all I added was some linen paper, some mirri card and a few gemstones. Claire - My oh my those birdies on the Double sprinkle of Kraft cd are indeed enjoying Wedded Bliss - can you get more loved up than that pair! Using Promarkers to colour and I've added some extra elements also from the cd. Ashley- I was inspired and used the Sugar Birdies Cd, and stamped the background paper using the Daisy Doodles Rubber stamp collection ! Fliss - I decided to make an unusual shaped easel style card with the elegant rose collection from the Love and Cherish CD combined with the shabby vintage papers from the All Around and Everywhere CD as they go together so well for a classic look. I added flowers punched from the papers, edged with bronze glitter pen together with pearls and some glittered flourishes to finish. Colette - I also used the Love and Cherish CD for my card this week, the paper design was printed onto pearl card, (which makes the pattern look really silvery) and embossed with the D'vine swirls embossing fold, I printed the wedding cake out 3 times, coloured and glittered parts of it and layered it up in tiers. I used some beading wire and heart shaped gems to make the decorations that are popping out of the top. The sentiment is one I have used for a long time and I can't remember where it originally came from. A few pearls and ribbon from stash finish it off. Lou: I have also used the new Double Sprinkles of Kraft CD to make my LARGE card this week. I adore this cute image and had to use it for this challenge. I made my own frame (covered with a paper from same CD) and matt/layered the topper. I cut some vines out and have decorated them using the roses from the embellishment section. I also used the same roses as a background paper as they are adorable images. Added a veil and a top hat to the owls to create a more wedding feel. The sentiment is from ????? (can't remember!). Good luck - you have until Sunday 24 April at 12noon GMT to enter and please remember our rules! 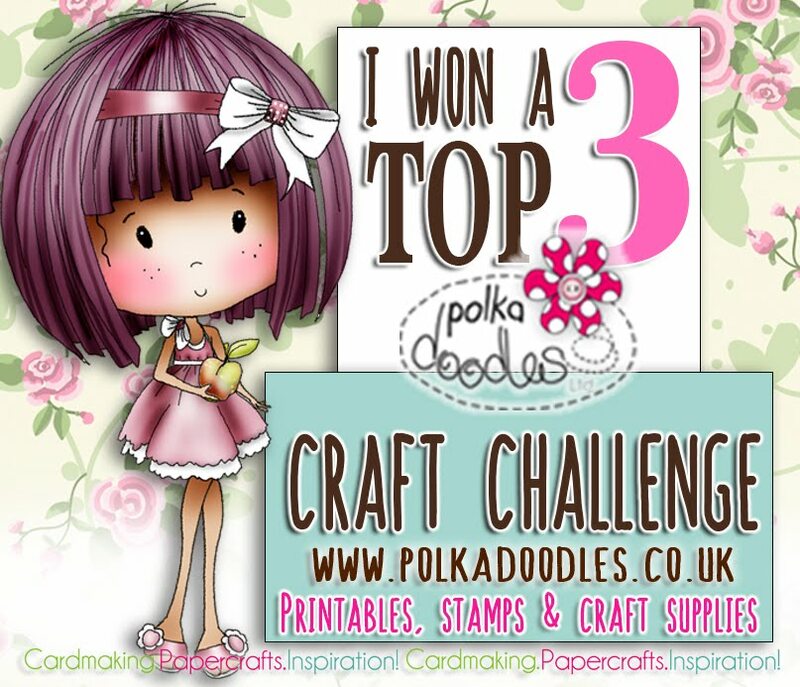 Hello all, it's Dee here as your hostess and it's time for another Friday challenge from Polka Doodles. 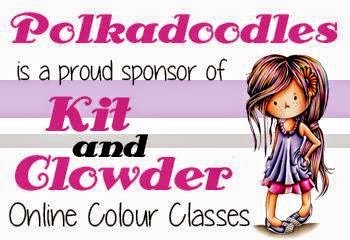 But first I need to let you all know that Nikky is demo-ing this weeks Pick Of The Week on Create and Craft TV starting at 12 noon British time today. Sky 671, Freeview 36 and Freesat 813. The new CD A Double Sprinkle of Kraft will be making an appearance so watch/tape/sky+ to see some amazing demos and inspirational ideas. Nikky will be doing live shows till Tuesday if it doesn't sell out and the rest of the week will be repeats. Plenty of chances to catch some of the shows. Back to the challenge and this week I have a sketch for you, but look carefully because I want you to mix your layers up and interlink your different elements. The Polkadoodlers have a few little rules which makes our life a lot easier when we come visiting your blogs: 1. Please follow the challenge! 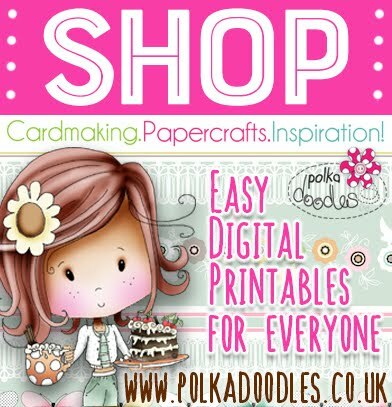 Fliss -I've made my card from the fabulous new A Double Sprinkle of Kraft CD as I've really loved working with the gorgeous papers and sweet images on there. I've coloured the lovely image with Promarkers and followed the sketch with papers and a border from the CD. My only additions were some pink paper and pearls from my stash and a sentiment from the Sugar Birdies Collectors Edition CD. Saskia - This robot, made in 3d, is so funny! The template and the papers are from the Paper Boutique III cd-rom! I just added some little star-stickers and twine from my stash. 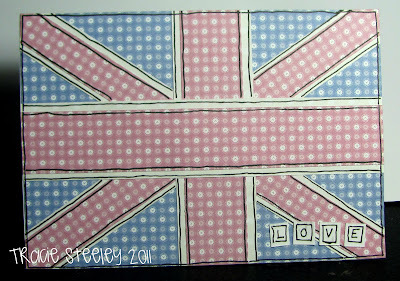 Claire I loved the sketch and it worked so well with all the wonderful papers from the new Double Sprinkles of Kraft cd. I have used Promarkers to colour the beautiful bird and birdhouse images. 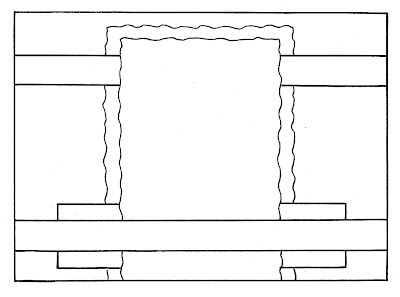 Lis-m . This is a fab sketch. I used the new "Sprinkles" cd, the colours worked together so well. I cut out and 3'd the girl with the daisies (from the in the garden section). Added a sentiment and glitter, simply but pretty. Ashley : I was inspired by various sets, I used the not for girls definitely for men and paper boutiqueII cds + the adorable little Nellienoo and sensational sentiment sets. Miria For my card I was totally inspired by the new CD Double Sprinkles of Kraft: everything comes from it except a few embellies from stash. Colette Well it looks like the new Double Sprinkles of Kraft is a big hit with us all. I've also used it for my card this week, Everything on the card, except for a strip of Jute, came from the CD. I flipped the sketch 90 degrees clockwise and made the scene up from various stampies on the disc, I coloured the black and white wellies stampie and layered it up to give a 3D effect and used the Kraft alphabet to make the word retirement. 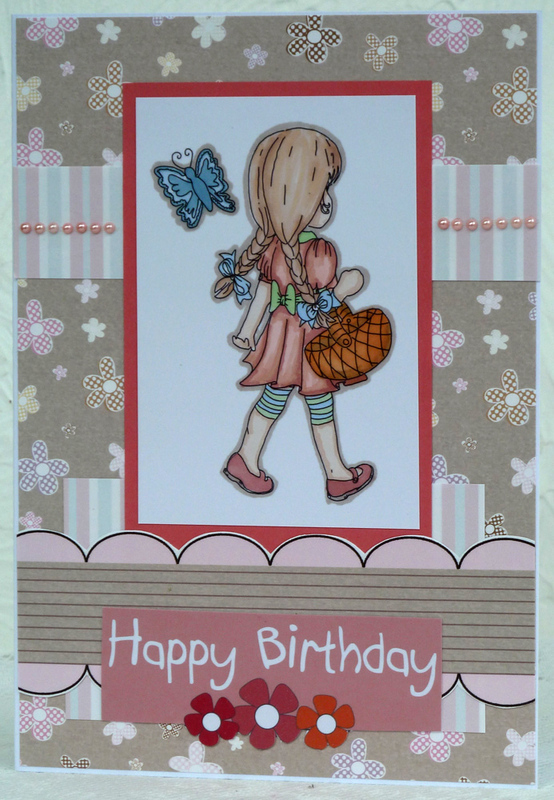 Josie: This week I used the backing papers, topper and sentiments from the new CD Rom A Double Sprinkle of Kraft. I distressed the edges of the papers and topper with Distress Inks. 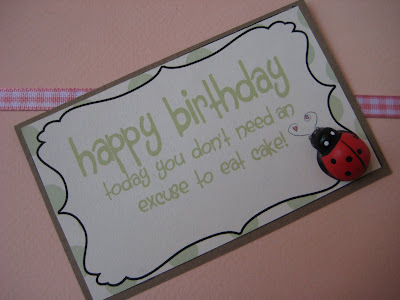 Tracie: I used papers and an image from Double Sprinkles of Kraft for my card this week. I watercoloured the gorgeous girlie with Aquamarkers, layered up some papers from the CD and added a sentiment from the new Sentiment Stamp Sheet, and finished with a couple of little gems. 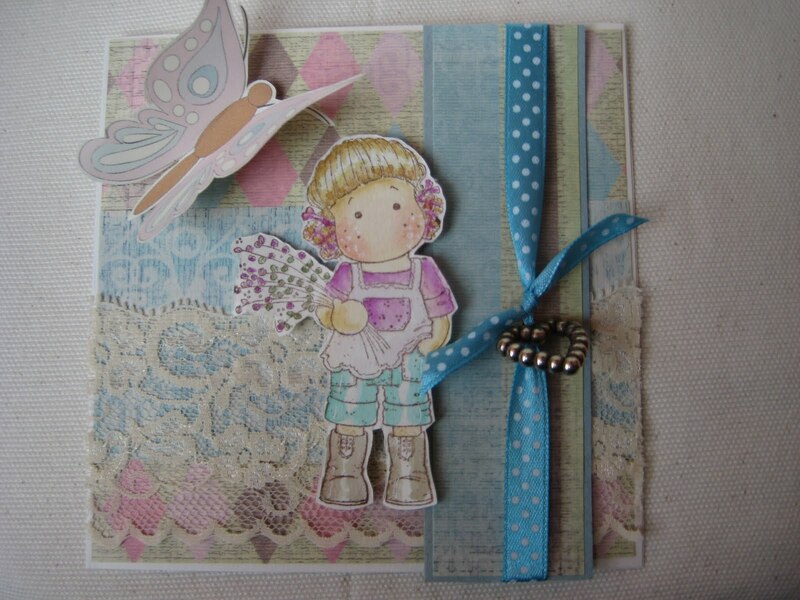 Emma, hi everyone, I used backing papers from the new Sprinkle of Kraft Cd alongside a stamped Flutterby Fairy with wings from one of the butterflies on the new CD too. I hand rolled some little paper roses with some punched leaves to finish off. Ruth: I too have used A Double Sprinkle of Kraft - all the papers are from the cd along with the very cute image! I've made the flower by cutting out circles of double sided card, lightly drenching in water and then waiting for them to dry - really easy! Dee: I've used the papers from the Wonderland CD for my card this week. 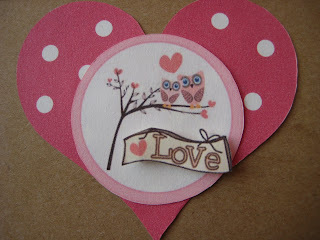 I've also used flower chipboard shapes. I covered one with a backing paper and I used paint dabbers on the rest. I then stamped with a sentiment from the sentiment set. I little bit of inking with weathered wood distress inkpad and 3 big brads finishes of this card. Good luck with the challenge - closing date is 12noon GMT on Sunday 17 April.